There’s a beautiful grouping of celestial objects visible just after sunset in the eastern sky. It includes the constellations Auriga, Taurus (with its Pleiades star cluster), Orion, and Gemini. Also in attendance is planet Jupiter, the brightest object in this grand display. And Jupiter will be joined by a Waxing Gibbous Moon on the night of the 21st. On that date the Moon will pass within 1-2° of Jupiter, depending on your observing location in the northern hemisphere. 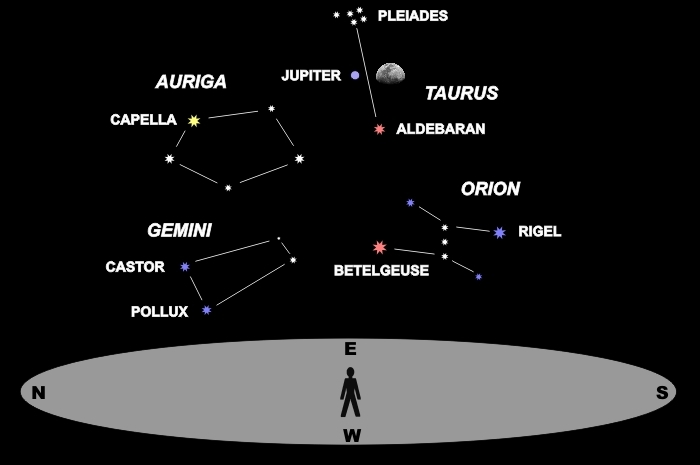 From parts of South America, the Moon will occult Jupiter, passing in front of it and hiding it from view. That occultation will last anywhere from seconds to about an hour, again depending on location. So many objects are visible that I chose to label only the constellations and brightest stars to avoid cluttering the chart with too much text. I also extended the vertical scale of the chart to 60° just to fit everything in. This is an awesome display even to the unaided eye. If you have binoculars, even better. As I’ve often pointed out, many of the stars that make up the constellations are too dim to be seen under less than perfect conditions. Hence the simplified constellation outlines above. Not many constellations resemble their namesakes anyway. Those names were assigned long before light pollution even existed. New readers take note: Stars are usually shown as “white.” Colors are indicated only when those colors are obvious to the eye, usually for only the brighter stars. And even those are somewhat “pastel” colors. The number of bright stars in this grouping is way over average, which is why it’s such a colorful display. Star brightness is indicated by size. Stars closer to the horizon will appear dimmer. If you do have binoculars, here’s three great targets. First, check out the Pleiades. You’ll see many more stars than just the “Seven Sisters” of mythology. Next, look at Jupiter. Depending on date and time, you could see up to four tiny moons orbiting it. Finally, look just south of Orion’s belt (those three stars in a vertical row) for a cloud-like smudge. That’s the Orion Nebula, a cloud of gas from which new stars are forming. You’ll enjoy this display, trust me. Dress warm, turn off all outside lights, and get out there 15 minutes early to give your eyes a chance to become dark-adapted. Except for the Moon, which will be in the grouping only on January 21st, this display will persist for a few weeks. So once the Moon is out of the picture, say, later this week, make a point of checking out these constellations a second time. Star colors will be much more apparent in the darker moonless sky. Postscript: The January 21 Moon-Jupiter conjunction discussed in this post provided an opportunity for a beautiful image through my 200 mm telephoto lens. You can see it on our astronomy club website here.